Everyone knows your attic need insulation, but many homeowners don't realize just how big of an impact the attic has on their home comfort and energy efficiency. 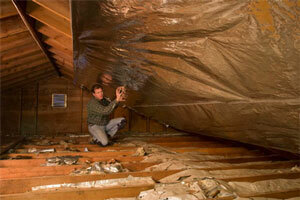 An under-insulated attic will cause significant problems in your home and cost you money. Dr. Energy Saver specializes in solving attic insulation and energy problems. Through solutions such as air sealing, insulation, vent fans, and radiant barriers, we can help you keep your home comfortable and save you money. If you're concerned about energy loss through your attic, contact your local Dr. Energy Saver dealer to discuss attic insulation options and vent fans! What contributes to energy performance? In a typical house, almost 50% of total energy use is attributable to heating and cooling, and the attic has a HUGE impact on heating and cooling efficiency. You've heard the two words that describe what goes on in an attic in terms of whole-house energy performance: "It's complicated." This complexity is easy to appreciate when you consider all the attic features that factor into energy performance: insulation (or lack of it), air leaks, soffit vents, the stack effect, ridge vents, attic fans, recessed lights, pull-down stairs, radiant barriers, and all the ducts and/or HVAC equipment frequently located in attics. Understanding what goes on in the attic will help you appreciate what an experienced, professional crew can accomplish to improve your home's energy performance and comfort, while also making it healthier, more eco-friendly and more affordable to own. 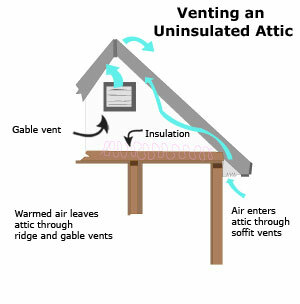 Here are the key elements of attic efficiency. Most attics don't have adequate insulation according to current recommendations established by the United States Department of Energy. At Dr. Energy Saver, we provide complete attic insulation using spray foam and cellulose insulation. By air sealing the attic then completely insulating the attic, we can eliminate the drafts and air leakage that waste your money and make rooms in your home uncomfortable. Radiant barriers help keep your conditioned air in your home. Radiant barriers work as reflective sun shades, making them an important addition for energy efficiency. An attic radiant barrier helps to prevent your attic space from overheating on a sunny summer day, saving you money on air conditioning. In the winter, an attic radiant barrier helps to keep heat from escaping, so you'll save money on heating costs, too. Dr. Energy Saver installs a dual purpose rigid foam insulation with a radiant barrier called SilverGlo™. This material is proven to cut your heating and cooling expenses by as much as 20%. 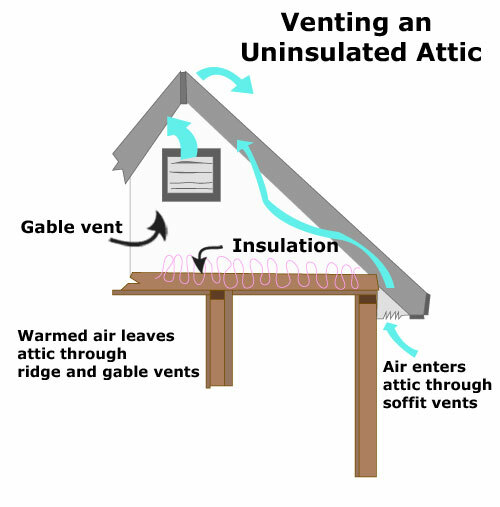 This diagram explains how ventilation can affect your attic (click to enlarge). An attic must have adequate ventilation to promote energy efficiency, prolong the life of roof shingles and help prevent mold and moisture damage. Dr. Energy Saver installs "passive" attic ventilation, which means that system relies on air currents and natural convection to operate rather than electricity. Not only is this more efficient, it also is a more reliable option. Your Dr. Energy Saver dealer will be able to evaluate your attic and recommend the right vent and fan options for your home. Tired of high heating and cooling costs and uncomfortable rooms? If you believe that attic insulation, radiant barriers, or ventilation might be right for your home, call Dr. Energy Saver today. We offer proven solutions to energy problems!